If you are looking for a serious relationship, then Chemistry.com is an online dating site well worth considering. It was launched in 2006 by the same people behind Match.com. This site however, uses a scientific system that is designed to match singles together based on their likelihood of being mutually attracted to each other. The system was developed by Dr. Helen Fisher, an American expert on human behavior who has studied how and why relationships work out. The principle of this system is that successful relationships are generally built on a combination of compatibility and chemistry. While most dating sites focus on matching singles based on shared interests and specific characteristics – which can certainly work – the Chemistry.com system takes things to another level. Members must take a detailed personality test and the site will then attempt to match people that have a very good chance of hitting it off from the moment they meet. With many success stories and a growing number of members, the Chemistry.com approach to matchmaking is proving to work. The first step in signing up at Chemistry.com is easy enough and you just have to provide a small amount of basic information. There is a lot more involved, though, in the process for creating a profile – which is primarily made up of the very comprehensive personality test. The first part of the test requires you to answer a selection of fairly standard multiple choice questions that are similar to those you will come across at most dating sites, designed to provide an insight into your personality. There are also a number of more advanced questions too, some of which involve images and audio. The next part is largely based on factual information and you must answer questions relating to your appearance, your education, your religion and your work. After this you will be asked a series of question regarding what you are looking for in a potential match. Finally, there is a free text section where you can write anything you like about yourself. You can also choose to add some photos to your profile at this stage. At many online dating sites you need to be pro-active in searching through the profiles of other members and selecting those that interest you. Because Chemistry.com uses their unique system to try and find suitable matches though, once you have added your profile you will then automatically be provided with a selection of potential matches. These profiles can be sorted using a variety of criteria and you can then take a look through them and decide whether you are interested or not. The communication tools are very good, and it is easy to get in touch with someone that interests you. You will also receive notifications when other members express an interest in wanting to know more about you. A feature called “First Meeting” helps to guide you through the process of making contact with someone and getting to know them better and, if it reaches the next stage, arranging a face to face meeting. As the main focus is about matching you with compatible members and helping you get in touch, there is not really a huge amount required in the way of additional features. There are a few little extras, though, that you might find useful. One particularly good feature is the control you have over who can see your photos. It is very important to upload photos when using a dating site, as other users will often ignore a profile without them; however you may want to upload some photos that you don’t want everyone to see. At Chemistry.com you can categorize your photos so you can have some that everyone can see and others that can only be viewed by those you provide access to. 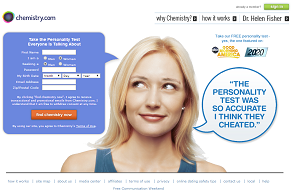 There is a free option at Chemistry.com, which allows you to complete the personality test and create your profile. You will also be able to see potential matches, but you will have to pay for a subscription if you want to contact other members. You can take a one month subscription for $44.95, or you can save money if you pay for three or six month’s membership at a time. A three month membership works out at $33.32 each month and a six month membership at $26.66. Our review made it clear that Chemistry.com is an excellent dating site if you are specifically hoping to meet someone and develop a serious relationship. Although you can’t search and look through profiles in the same way as you can at most other online dating sites, there are many couples that are enjoying relationships thanks to this unique matching system. It is by no means one of the cheapest dating sites, but it is a relatively easy site to use and once you have completed the personality test you are in with a very good chance of meeting that someone special.